I cannot say enough how great my team is. I love how well we work together and how willing each team member is to sacrifice themselves for one another. 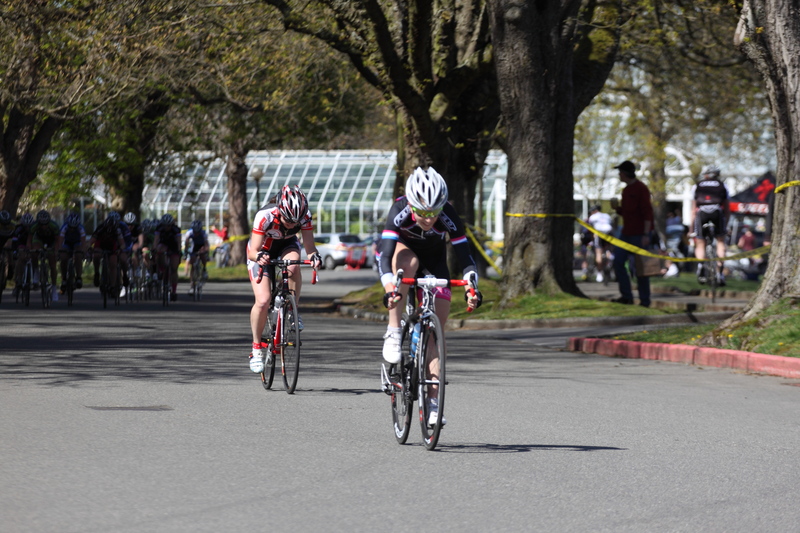 This Saturday was a Seattle classic, the Volunteer Park Criterium. It’s run on a D-shaped loop with a short climb and and a long straight slightly uphill slog to the finish. Every time I’ve done this race there has been a break that got away. Our team goal was to be aggressive, go for primes, and make sure at least one of us was in every move. 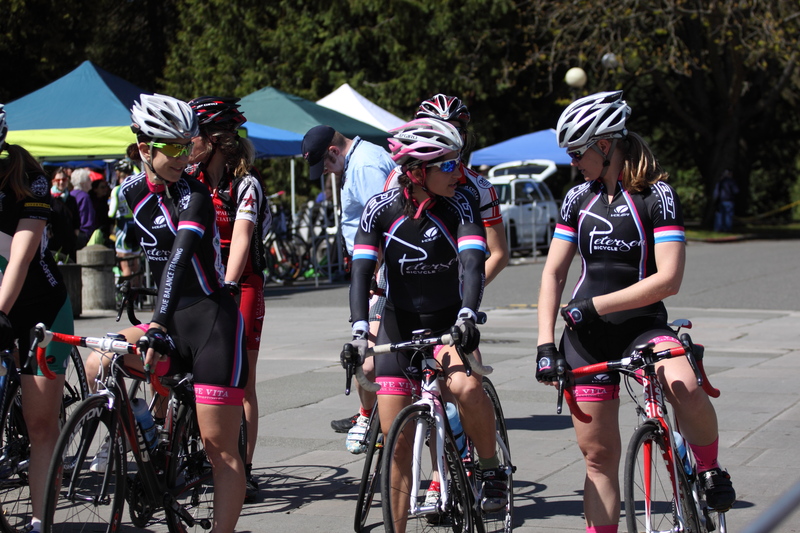 If we were all together at the end I was to be leadout for either Courtenay or Alicia. The race started out fairly slow with everyone kind of sizing each other up. After two solo wins in a row, I felt like I had a huge target on my back. 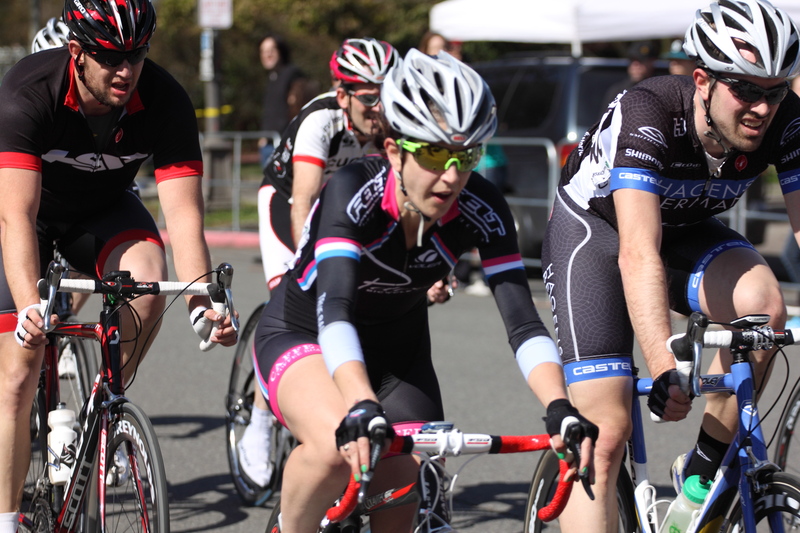 Courtenay easily took the first two primes and spent a little time off the front of the race both solo and with other racers. Kelly threw in a couple of really smart attacks and also spent some time off the front and Alicia single-handedly pulled back a dangerous break. I attacked a couple of times in the first 30 minutes but pretty much the whole peloton was stuck to me like glue. With about 10 or 11 minutes to go in the 45 minute race the announcer called a prime and I decided to lead Courtenay out for it. I knew Jocelyn (who is crazy strong, yo) was on my wheel and Courtenay was on hers. I took them both to the line and Jocelyn got it but right as we crossed the announcer called another prime! I decided I was going for this one myself and when Sarah Fletcher made a move up the hill and around the inside of the corner I was right on her wheel. I came around her about halfway up the straightaway and took the $50 prime. What I hadn’t realized when I went was that Sarah had pulled us away from the pack and that I had gapped her with my attack giving me about 5 seconds on the pack with only 5 or 6 laps left to go. I wasn’t sure I could hold off a hard charging group with several extremely strong women but I had a gap and I was going to commit to it. With three strong teammates in the pack it was a win-win. Either I win solo or my teammates can rest while the rest of the pack chases and can be ready to set each other up for the win. In the end I was able to put a little more time into the pack and come up with another awesome salute (“no, you all are the awesome ones!”). After my victory lap (aka my hacking and wheezing lap) I hopped into the Cat 3 men’s race with Niels. I promised myself that I would finish at least half of the race and that’s exactly what I did. 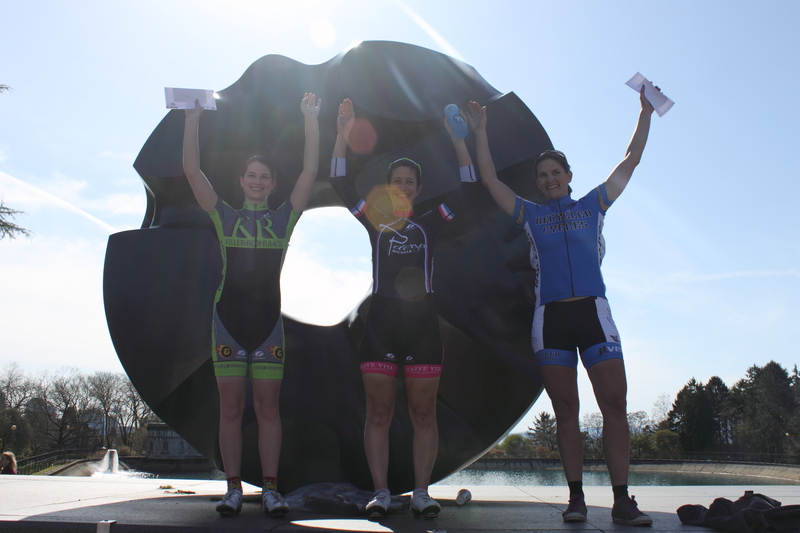 After several near crashes I called it good and pulled out so I could spin down and do the Cat 1/2 women’s podium. I also worked a bit on my podium pose so that I wouldn’t look like such a dipshit. It’s a little better. (thanks a ton to my pal Sara Youmans for humoring me and agreeing to do the podium). 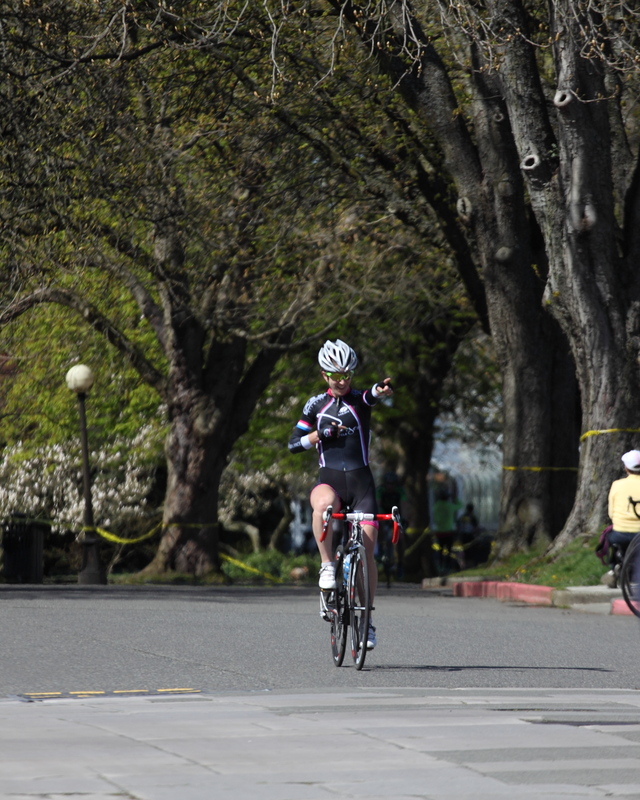 Sunday was an 11.5 mile TT in Portland at PIR. There’s not much to tell. I won but Leia Tyrrell (back at her first race after a devastating crash a year ago) and Sue Butler certainly made me work for it. I really don’t ever recall smiling during this race. I’m just going to assume I have a really happy pain face. So one thing that’s been interesting about the last month, since I started winning races is other racers’ attitudes towards me and my team. I’ve made it a policy for myself and for my team to never try and undermine another racer’s success or victory with excuses or negativity. There can only be one winner on any given day and most of the time, it won’t be you and it’s really unfair to try and take something away from someone’s victory by making excuses for why they won, why you didn’t win, why they shouldn’t have won, etc. I keep hearing grumblings that the times I’ve gotten away, my teammates have been berated and yelled at by other racers. I’m also hearing grumblings that I’m only winning because my team is engaging in unsportsman-like conduct or because no one noticed my attack until it was too late, etc. Hearing this totally breaks my heart. My team and I have worked so incredibly hard over the last several months to be cohesive and fit. We have a no-blocking no-disrupting policy on the team that I hope and believe we have absolutely stuck to. I killed myself this winter and was out and doing my workouts in the worst possible weather and never making excuses for why I couldn’t ride on a given day. During the snowstorm in January, I was on the trainer for 2+ hours a day for a week and a half straight. I have done my workouts in the dark, in the rain, and occasionally in the snow and sleet. I feel bad writing this because I’m not trying to passively-aggressively call anyone out on what I think is bad behavior, I’m just saddened by the whole thing. At the end of the day, I’m really a pretty sensitive person and I let this stuff get to me more than I probably should. However at the same time, I think acting this way is totally inexcusable. Of course we all train hard and we all want to win but just because you don’t win on any given day doesn’t mean that you should ruin that day for the person who did win. One quick anecdote before I’m done with this thought. I raced a little bit of road when I was in college and in that time I only ever won one race. It was a circuit race outside Boston and I won it in a sprint finish. I jumped the yellow line just after the 200m mark and came around wide to take the sprint by a bike-length. I was ECSTATIC. Not more than 10 seconds after I crossed the line some nasty girl from Harvard came up to me and said “You only won because you jumped the line early cheater!” I felt totally deflated and even though I checked with the officials to make sure my win was legit (it was) that nasty girl ruined my first ever win. 13 years later and I still haven’t forgotten that. That said, I’m still so happy for how well the season’s going and how well all of my training has paid off. The weather’s finally getting better in Seattle and I still love to ride my bike. Things are great! Thanks to Kevin Tu for all of the awesome VP Photos! This entry was posted in Racing and tagged Criterium, palmare, race report, time trial. Bookmark the permalink. good for you. loved your story. “I’ve made it a policy for myself and for my team to never try and undermine another racer’s success or victory with excuses or negativity” I love that. Sharing excuses is an annoying habbit too many of us have! Great Story and it shows how the hard work and determination pays off!! !